Distribution: Open forest in a very restricted area on the far south coast of Western Australia. Derivation of Name: Corymbia...from Latin, corymbium, a "corymb" referring to floral clusters where all flowers branch from the stem at different levels but ultimately terminate at about the same level. ficifolia...with leaves resembling those of the genus Ficus. Corymbia ficifolia is one of around 80 eucalypts which were transferred in 1995 from the genus Eucalyptus to the newly created genus Corymbia. The species was formerly known as Eucalyptus ficifolia. 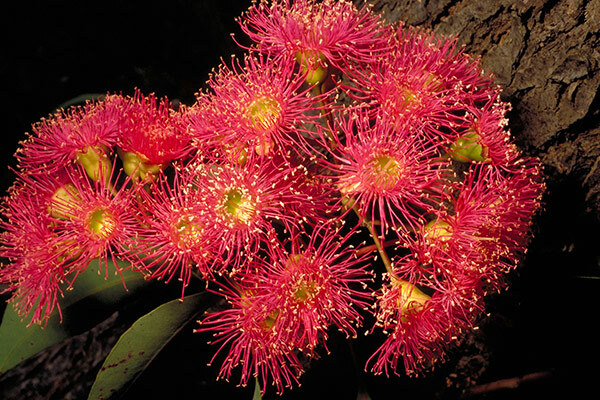 The red flowering gum is one of the most widely cultivated of all eucalypts both in Australia and overseas. It often grows larger and more vigorously in cultivation than in its natural habitat. The species is best suited to temperate districts with low summer rainfall and humidity. It can be grown in sub-tropical areas in well drained, sunny positions but cannot be regarded as reliable in those areas. Even in temperate areas the species can be unreliable - in the Sydney region, for example, there are some excellent examples but there are probably just as many that fail to thrive. In suitable climates the tree is moderately fast growing and may eventually reach 15 metres but is often smaller. Foliage is dark, glossy green and the bark is rough and persistant (ie it does not shed annually). Corymbia ficifolia is superficially similar to Marri, Corymbia calophylla. It differs in that it has barrel shaped fruits rather than urn shaped, its seeds are smaller and have wings, and its oil glands in the leaves are not prominent. It crosses readily with Corymbia calophylla. The hybrids are intermediate in these characters and often set fewer fruits (gumnuts). C.ficifolia flowers in summer and is a colourful addition to southern hemisphere gardens at Christmas time. Because of the difficulty in propagating all eucalypts from cuttings, plants available in nurseries have been usually grown from seed. Seedling variability means that the resulting plants may vary from the parent both in the habit of the plant and in the flower colour. Consequently, the flower colour of seedlings cannot be guaranteed and white, pink and orange flowers are seen, as well as red. Some research has been undertaken into grafting of C.ficifolia to enable select colour forms to be guaranteed and to extend the range where the plant can be successfully grown. The results of this research have now reached the stage where grafted plants are available commercially. These include selected forms of C.ficifolia and hybrids involving C.ficifolia. 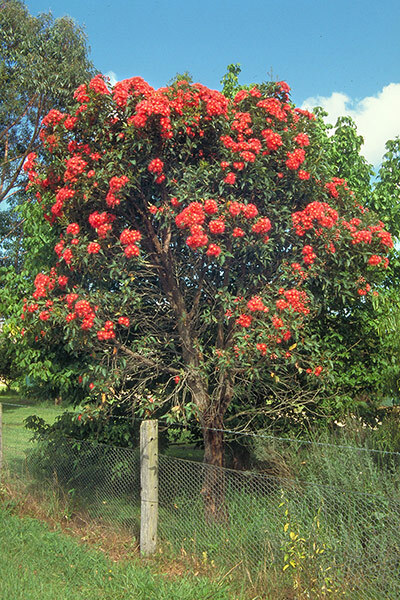 For further information on these, see Corymbia Cultivars. Two small growing forms of C.ficifolia that have become available as grafted plants are "Dwarf Crimson" and "Dwarf Orange". These are reported to grow to about 3 metres high by a similar spread and would be suited to smaller gardens.